Here’s an amusing story, if a sad one for Porsche fans. After his Porsche 911 sports car broke down, the owner, faced with a massive repair bill, decided to donate the vehicle to a local charity — the Commonwealth Second Amendment (Comm2A), a group that works for gun law reform in Massachusetts. 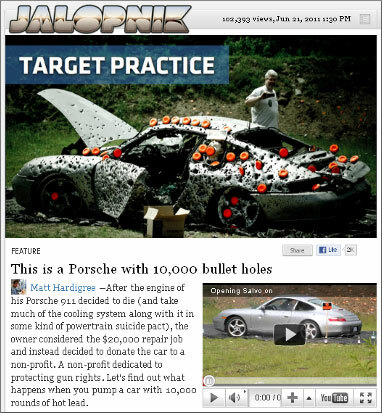 Well Comm2A, with co-sponsor Northeast Shooters, decided the best use of the donated Porsche was as a target! The two organizations hosted a fund-raising shoot-out, with the Porsche as the star of the show. Share the post "Can’t Fix Your Car? Just Shoot it … Porsche Charity Shoot-Out"